1) Dark Copper with big thick legs. 2) Similar but seems lighter. Legs are a little thinner as well. 1) Sharp and hot with char and homemade caramels. 2) Not as sharp. The char comes through even more. The caramels are still there, but they now are studded with pecans. 1) Hot, but sweet. Assertive but not aggressive, more caramel and chewy vanilla toffees. 2) Thinner, but milder belying its high proof. More complex than the Kahn’s. Wood, vanilla, toffee, caramels, pecans and walnuts. 1) Big and hot especially on the lips, tempered by a growing sweetness in the form of the aforementioned vanilla toffees. 2) Milder, but still bold. The sweetness leads more than in the Kahn’s bottle, but the tingle on the lips is still there and persists for what seems like a very long time. Parting Words: These are both very good private bottlings. The Kahn’s drinks like an exceptionally good version of the standard bottling. 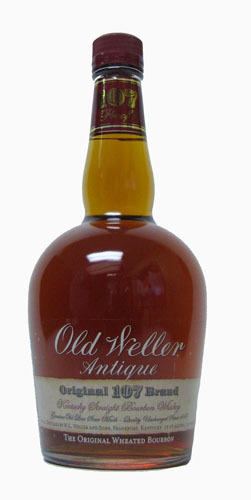 The Loch & K(e)y bottling (associated with Julio’s Liquors in Westborough, Massachusetts) is more refined tastes closer to a Van Winkle wheater than the standard Old Weller Antique. Both these bottlings are sold out, but if you find a friend with one of them or you have an opportunity to buy a future private bottling of Antique from either of these retailers, I highly recommend you do so!